‘Selling’ the pandemic threat . . . again! 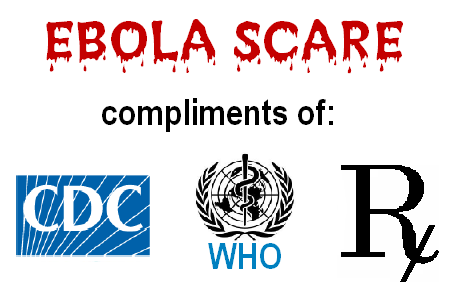 PEOPLE WON’T BE DUPED INTO BELIEVING THAT EBOLA IS A DEADLY PANDEMIC UNLESS THE MEDIA LAYS THE GROUNDWORK! Past history supports that the media is used to frighten the public into complying with policies that are not in their best interest. So, to convince the unsuspecting public that there is a deadly ‘ebola pandemic’ on the rise, sophisticated perception management campaigns are utilized. It is well known that if the public doesn’t believe the disease is a threat, they won’t be interested in a vaccine solution. It is more likely than not an ebola vaccine will be made available, and it is extremely likely it will cause more harm than any disease. See: Vaccine-induced Disease Epidemic Outbreaks. The following is from the “opinion” page of the NYT (Sept 11, 2014). It follows the pandemic media playbook Dr Sherri Tenpenny describes so well in her book Fowl. Author: Michael T. Osterholm, PhD, director of the Center for Infectious Disease Research and Policy at the University of Minnesota. What is not getting said publicly, despite briefings and discussions in the inner circles of the world’s public health agencies, is that we are in totally uncharted waters and that Mother Nature is the only force in charge of the crisis at this time. There are two possible future chapters to this story that should keep us up at night. The first possibility is that the Ebola virus spreads from West Africa to megacities in other regions of the developing world. This outbreak is very different from the 19 that have occurred in Africa over the past 40 years. It is much easier to control Ebola infections in isolated villages. But there has been a 300 percent increase in Africa’s population over the last four decades, much of it in large city slums. What happens when an infected person yet to become ill travels by plane to Lagos, Nairobi, Kinshasa or Mogadishu — or even Karachi, Jakarta, Mexico City or Dhaka? The second possibility is one that virologists are loath to discuss openly but are definitely considering in private: that an Ebola virus could mutate to become transmissible through the air. You can now get Ebola only through direct contact with bodily fluids. But viruses like Ebola are notoriously sloppy in replicating, meaning the virus entering one person may be genetically different from the virus entering the next. The current Ebola virus’s hyper-evolution is unprecedented; there has been more human-to-human transmission in the past four months than most likely occurred in the last 500 to 1,000 years. Each new infection represents trillions of throws of the genetic dice. If certain mutations occurred, it would mean that just breathing would put one at risk of contracting Ebola. The ongoing ebola campaign is a great example of Problem – Reaction – Solution, i.e. artificially create the problem (blaming it on nature or humanity), fuel the reaction and offer the predetermined solution. First, we need someone to take over the position of “command and control.” The United Nations is the only international organization that can direct the immense amount of medical, public health and humanitarian aid that must come from many different countries and nongovernmental groups to smother this epidemic. Translation: global problem needs NWO global governance solution! None of those he wishes to put in “command and control” were elected . . . by anyone! This entry was posted in corruption, Medicine and tagged CDC, ebola, pandemic, propaganda, vaccine, WHO. Bookmark the permalink.